This week we take a look at how to get the most out of your refractometer using BeerSmith. Many people prefer refractometer for ease of use, small sample size and simpler temperature management, but you need to do some adjustment to the numbers you get from your refractometer to be able to use it accurately. I have an in depth article on refractometers and how they operate here. The short version is that a refractometer can be used to replace your hydrometer and take accurate gravity readings of both unfermented and fermented wort. They work by shining light through a prism and measuring the refractive index of a small sample of wort or beer, which you can then use to determine the specific gravity. 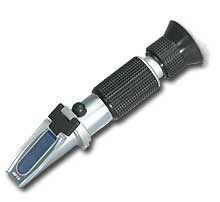 In practical use, a refractometer is very simple. First you callibrate (see below). Next, you typically clean the glass slide off and then put a few drops of wort on the slide and then close the cover. Next you hold it up to a light source and read the measurement from the scale. 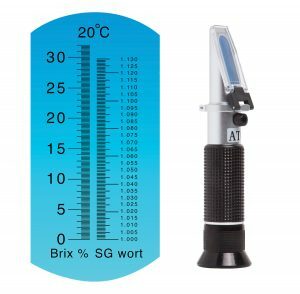 Most modern brewing refractometers have a dual scale showing both specific gravity and brix. Since brix is equivalent to plato to over three decimal places, you can safely assume the brix scale is the same as degrees plato. I prefer to work in brix/plato with my refractometer, remembering to multiply by four points and add 1.000 to get the number in specific gravity. For example 12 plato is 4×12=48 points or 1.048 SG. However, since almost all refractometers are calibrated to measure sugar in water and not maltose (the sugar beer is made from), a small adjustment of typically 4% must be made to unfermented wort gravity readings. There is a calibration process (below) that will give you a very accurate number to use here. Fermented wort has a high percentage of alcohol which changes the equation used to determine the gravity substantially, so a different calculation must be used for fermented wort, and I strongly recommend using a tool like BeerSmith for your fermented readings as the raw SG or plato number you get from the refractometer will not be accurate. Before you calibrate your refractometer you want to set visual focus. Most refractometers have an eyepiece that rotates and you simply turn it until the scale of the refractometer is in focus as you hold it up to a light. Actual calibration of a refractometer is a two step process. In the first step you use distilled or deionized water to set the “zero” point for the device. Distilled water should read zero brix/plato or 1.000 SG. Most modern refractometers have a knob or screw on top of the device to adjust the zero. If you don’t have a knob, you can go to the refractometer tool in BeerSmith and click on the calibration button and enter your zero reading and BeerSmith will apply that offset to future readings to compensate for your slight offset. The second step is to mix a small amount of wort – say 2 oz of dry malt extract in 8 oz of water and then take measurements of this sample with both a good hydrometer and also your refractometer. These can be entered into the BeerSmith refractometer calibration dialog (click calibrate from within Tools->Refractometer) to determine your “brix correction factor”. Typically this number is around 1.04, which means that the raw reading from the refractometer is adjusted down about 4% to compensate for the fact that you are measuring maltose and not table sugar in your unfermented measurements. Once you have the zero set and also the brix correction factor set you are ready to take readings. Measuring unfermented wort gravity is the easiest. You simply put a few drops on the clean slide, close the slide cover and hold it up to a light. The raw original gravity reading you get will be close to the actual value (typically around 4% too high) and you need only enter that raw value into the Tools->Refractometer view using Unferemented Wort Gravity as the calculation setting and you will get the corrected gravity with the proper brix adjustment factor from our calibration. Because of the presence of alcohol which alters the refractive index of the beer, both fermenting and fermented raw readings from your refractometer cannot be used directly. You need to enter the raw values into the Tools->Refractometer view using the Fermenting Wort Gravity calculation setting to get an accurate reading. Note that this tool requires both a current refractometer reading and also an original gravity reading – taken before you fermented your wort. So if you use a refractometer its important that you record your OG before pitching yeast. Enter the current refractometer reading and also your recorded original gravity reading into the tool, and you will get the corrected gravity reading and also ABV and ABW. You can use this tool on both “in progress” fermentation and also for measuring Final Gravity. BeerSmith also has an additional calculation labeled Original Gravity of Finished Beer. This tool, though more rarely used, can be used to backtrack the original gravtiy of a beer based on a final refractometer and final hydrometer reading. Basically the program calculates the amount of alcohol based on the difference between the refractometer and hydrometer reading and uses that to estimate the OG of the beer. To use this setting just take a refractometer and hydrometer reading of your fermented beer, and enter them in the refractometer tool. That’s an overview of the refractometer tool in BeerSmith. For more about refractometers read my detailed article here on refractometers and how they work. Thanks for joining me on the BeerSmith Home Brewing Blog. Be sure to sign up for my newsletter or my podcast (also on itunes…and youtube…and streaming radio station) for more great tips on homebrewing. This is great information to make my refractometer more accurate, cant wait to try it out! I use mine while mashing to track the progress as well as when sparging so I don’t over sparge by going below 1.011. It is quick and easy to use because you dont have to collect a jar full and cool before getting your reading, just a drop or two and you are good to go. I use BeerSmith in our Homebrew Store to calculate all of the recipe kits and having the calibration tool built in is very convenient. Thanks BeerSmith! Thank you for your articles, I learn a lot reading them. When I meassure my OG to eg. 13.0 Brix, the second scale (SG wort) says approx. 1056. But when I enter 13.0 in Beersmith (Unfermented wort gravity), it converts it to 1051. With the scale named “SG wort” I would expect it to be quite accurate for beer (maltose, not sugar water). My copy of BeerSmith does not have a section in the Refractometer option for measuring FERMENTED WORT. It only has a section for determining the Brix correction factor for unfermented wort. Question: is it not in my Beersmith program or am I not looking in the right place? I think you are looking at the options dialog – try going to Tools->Refractometer.